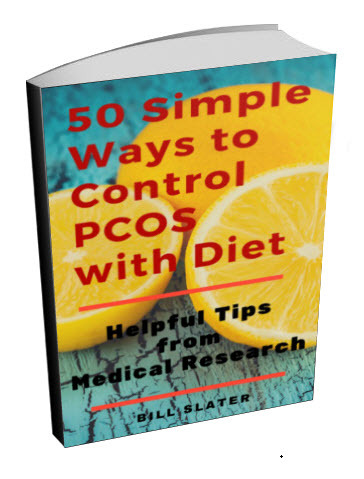 I have been diagnosed with PCOS since 2001. When I first found out the doctor basically said: "you have something called PCOS and you will need to stay on birth control or you will get cancer, and by the way, you won't be able to have children with out medical help." I was in shock to say the least. I have now been married for the past eight years and we still have never been able to become pregnant. 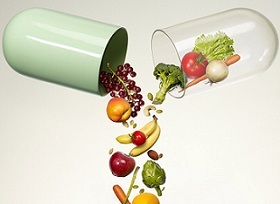 I have tried almost everything, and have spent so much money on doctor’s visits after doctor’s visits. Every time the answer would be you need to lose weight and exercise and you will be fine. Yeah.... Only I just don't lose weight like other people do. 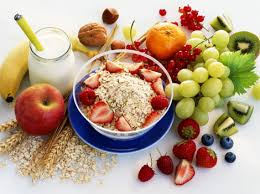 I would exercise for one hour at least three times a week and changed my diet as best I knew how. I changed to all whole-wheat products and cut out fatty foods and sweets. Nothing happened! After three months who has the drive to keep going with nothing to motivate you. We are now adopting which I am very excited about; however, I still want to become healthy and lower my chances at getting diabetes, high blood pressure, etc. 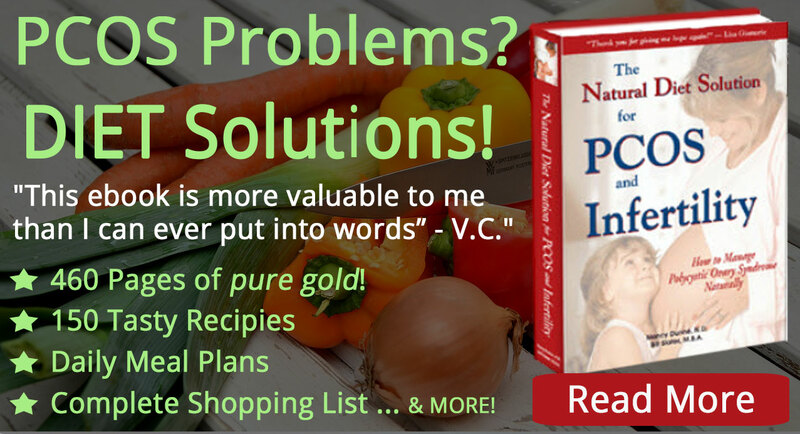 I have ordered my copy of The Natural Diet Solution for PCOS and Infertility, and can't wait to get it in the mail. I am so excited after reading so many good results from following this book! I look forward to being a slimmer, healthier, happier, me. 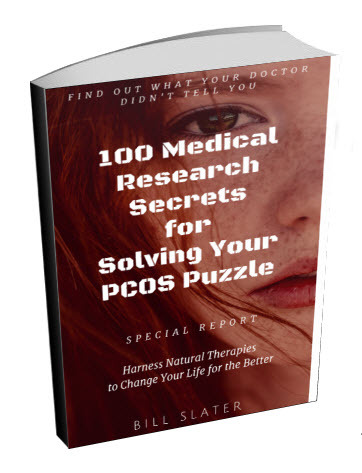 Editor's comments: Hi Shasta, PCOS can be a very challenging road to travel. It's hard to avoid discouragement. I agree the best focus is on improving your health and not focus on the frustrations of the difficulty of losing weight. The truth is, you'll have to work a little harder and more persistently on building and maintaining your health that some other people. This may mean more attention to your diet, and getting more exercise than what most people do. 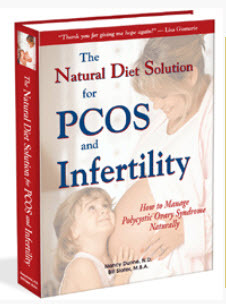 The Natural Diet Solution for PCOS and Infertility is a fairly radical departure from the diet you may be accustomed to. It is designed to help you reduce insulin resistance, which will in turn help you to lose fat weight and reduce long term risks of diabetes and heart disease. The book proposes more than a diet. It proposes a different kind of lifestyle. 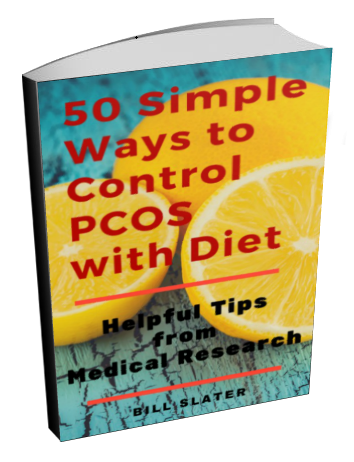 You might also consider selected nutritional supplements to help with insulin resistance and PCOS symptoms, such as d-pinitol. OMG! Those words were exactly what my doc said to me. I went out and found a doctor who was interested and more knowledgeable in PCOS because I wasn't prepared to accept that diagnosis. I suggest you do the same. Many health professionals are excellent although they are limited by so many things and they tend to treat the symptoms rather than the overall health. For an holistic approach I always pursue natural and alternative remedies. Join in and write your own page! It's easy to do. How? 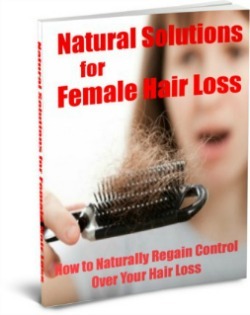 Simply click here to return to PCOS Success Story.